Easily add some antioxidants into your smoothie routine with a grape smoothie. Grapes are packed with flavonoids, a phytonutrient. The flavonoids are what make the skin of the grapes darker in color. Two studied flavonoids are quercetin and resveratrol. Both of these compounds in grapes have shown that they may decrease the risk of heart disease. Wine also contains these big health benefits. The darker the wine in color the more concentrated the flavonoids. But we don’t have to drink wine to receive the benefits. We can go directly to the fresh source from where wine came from. GRAPES! And smoothies are a great way to get those nutrients into our bodies. #1 - Grapes are extremely sweet. So you don’t need to add a bunch of sweetener to your smoothie. Believe me. I added sweetener to my first smoothie with grapes and I hardly could drink it down! 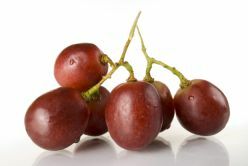 #2 – Grapes contain a lot of juice. Cut back on the liquid in order to have flavor packed healthy smoothie recipes! So be creative and have fun with your grapes!